Update – we now have a new version of Sing & See that doesn’t have the MIDI opening problem on Windows 10. On the Sing&See menu go to “Help” and then “Check for updates” to download the updated version for your system. Update 2 – one person still had problems – it appears that some audio software may disable the inbuilt Windows MIDI Synth. 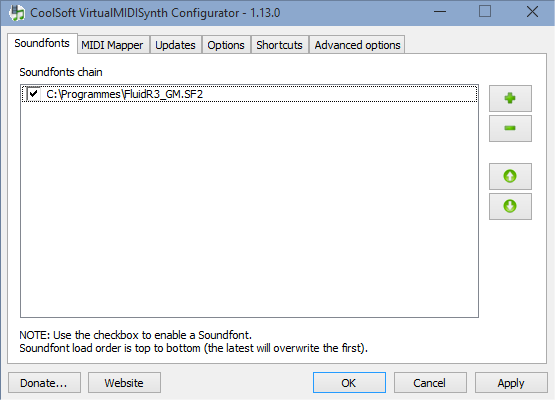 The best alternative in this case (or if you want to experiment with changing the sound fonts used in your in-built Synth) is to download and install the VirtualMIDISynth program from the coolsoft website below. There’s a donation button on the site to help the developer of that software. On the webpage there are some “SoundFonts” that contain the actual MIDI synth sounds for each key. Any of these should work, however one of the smaller ones is TimGM6mb. Some of the other sound fonts (e.g. the FluidR3_GM which is also good) require you to also download and install a decompression program called sfArk. By the way, you might want to copy the extracted sound font file (e.g. TimGM6mb.sf2 or FluidR3_GM.SF2) to somewhere safer than the Downloads folder. Click on Apply, restart Sing&See, and, hopefully, Sing&See will now play notes! VirtualMIDISynth has other cool features such as the ability to add more than one sound font and choose which one you want to use at any time.